For this installment of the JSBenchmark update, I’d like to focus on the browser speed performance improvement in Internet Explorer. The average performance was exactly the same (a score of 28). The lack of improvement is NOT due to a lack of adequate benchmark results. Currently, JSBenchmark has 494 IE6 results and 605 IE7 results. These results are in disagreement with other sites that have suggested dramatic IE7 improvements (e.g. qooxdoo and the IEBlog). Given the JSBenchmark results, I’m skeptical about the true benefit of the improvements. 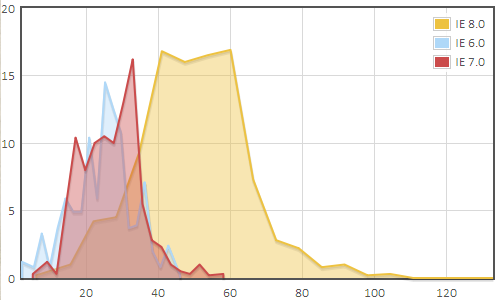 It is possible that JSBenchmark isn’t benchmarking the improved areas of IE7 (e.g. AJAX), but it’s hard to say. There is, however, a very large improvement in IE8 performance. Microsoft is much more verbose about the performance improvements in IE8. After reading this IEBlog post, you’ll note that Microsoft is claiming a 1.3-2.5x improvement in speed over IE8. As opposed to the IE6/IE7 performance claims, JSBenchmark does substantiate this performance claim (currently, a 2x improvement on JSBenchmark). Although a doubled improvement in speed is noteworthy, IE8 is still lagging way behind the competition. On JSBenchmark, it is currently 6.2x slower than Chrome 4.0 (the benchmark leader). What’s in store for IE9? In IEBlog’s early look at IE9, they show a graph of Webkit performance (shown below), where IE9 is far improved from IE8, and nearly competitive with other browsers (e.g. Firefox and Chrome). Webmonkey does a great job putting Microsoft’s news about IE9 into perspective, specifically that Microsoft is merely “catching up” to the competition, and is truthfully a few years behind the cutting edge of browser development. The last correspondence from Microsoft regarding IE9 was in November 2009. To my knowledge, a release date for IE9 has not yet been described, but it will be very interesting to include IE9 Beta results into JSBenchmark.